This picture was taken as we were leaving Bainbridge Island last year. As your heading to the ferry terminal from downtown you will come across a small somewhat old fashioned gas station. If you venture into the gas station you will find a few old oil company signs. The man who was in this area at the time I was taking pictures asked me if I liked the old signs. At the time I wasn’t really sure if he was being friendly or condescending. I just gave him a reply of yea and moved on. My feeling at the time was that maybe he wasn’t keen on people coming in and taking pictures. I very well could be wrong and I of course didn’t stick around to find out. At the time I was also kind of in a rush to get back to catch the ferry to Seattle. While there has been much debate about the true worthiness of alternative fuels. I honestly don’t think any sane person who doesn’t have an agenda could argue that having alternatives in place is long overdue. As a nation we should be ashamed that we are no longer innovative and advancing. One of the biggest examples of this is the fact that we are still driving vehicles that run fossil fuels. Viable solutions to lower our dependency on oil exist. The issue is implementing the alternatives. In many cases you can put to use alternatives without having to make large compromises. Yet most people are boneheaded and don’t understand this. It is truly sad that ecofriendly fuel methods from a hundred years ago have not been improved upon and put to use. What is more aggravating is the fact that our nation is still not putting waste products to good use. While I’m not sure what blend of BioDiesel is being stored in the tank above. It could be argued that anything that contains less oil is a good thing. What amazes me and aggravates me at the same time is that a 20% blend could be labeled BioDiesel. I’ll include a link below that should help explain that a little more. Just keep in mind that there can be different levels of ecofriendly when it comes to alternative fuel sources. 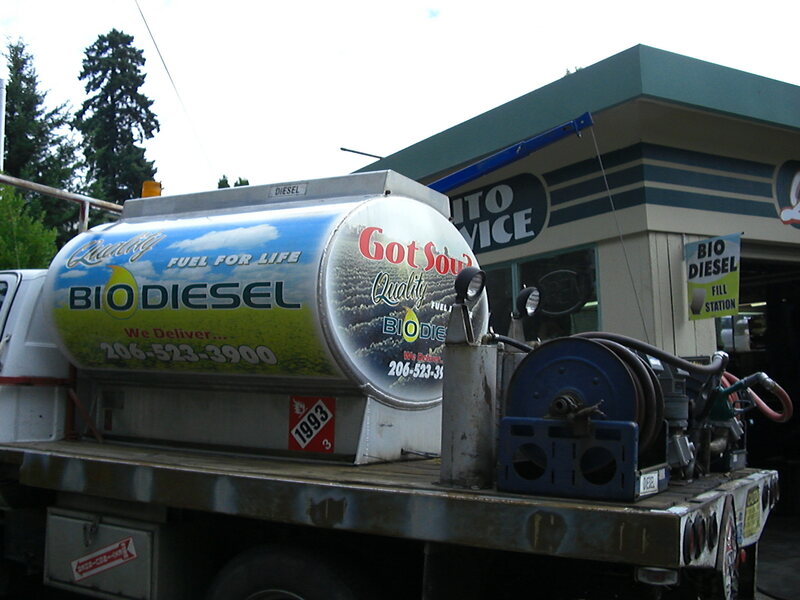 Not everything that states BioDiesel is 100% pure vegetable oil or other natural product being recycled. I’d assume with the Got Soy label on the tank above that this was pure veg. I didn’t inquire about this so I can’t say for sure. You could always call the number and ask yourself. 206-523-3900 for those in the Seattle area. Last year ( November 26 , 2007 ) The State Journal Register did an article on a Illinois College student who was taking BioDiesel very seriously. Jason Miles has a Volkswagen Jetta he runs on used cooking oil. There was something very telling about the general attitude in our culture within the story. It seemed Jason almost had to beg restaurants for the chance to use their used cooking oil. You would think these establishments would be more than happy to give away this waste product to a reliable entity that would put it to use. Granted I’m not sure what arrangements these places currently have with waste haulers who take the waste product off their hands now. But you would think that giving cooking oil waste to a good cause would be a wise marketing decision. This could be promoted as a way to show the restaurant cares about being ecofriendly. Even though gas prices could easily reach $4 a gallon this summer. I don’t think even that will be enough to have people start considering and looking for alternatives. There are many things in the way of these greener sources being put to use. The fact that the automobile industry has no real incentive to produce vehicles to run ecofriendly fuels, consumer education and availability. If you show consumers that they don’t have to give up what they think they will to go green. Then these consumers are more likely to make purchases that will benefit everyone. The unfortunate truth is innovation in the United States has been a stagnant concept for awhile now. Those that wish to do things differently and lead by example are ridiculed and made fun off. But many of these people should be listened to and those that can afford to should follow their example. I’d have no problems buying a diesel that could be converted to run on veg if I had the money to make the vehicle purchase as long as I had a reliable source for fuel. That last part is what stops many people from taking the step of making a change. Several traditional gas stations in my area sell BioDiesel. However from what I’ve seen this is only a 20% blend. I’d rather have a source that is closer to the 100% veg. That link is the State Journal Register article reprinted in a sister newspaper. SJR is horrible about keeping online material available. They archive it and demand you pay to access it.